When is a workshop also an art event? How can a literal white space be used as a site for exploring decolonial practices? What conditions (internal, external, energetic) inspire composition? Each Tuesday this March, SFMOMA’s White Box is serving as a container for de(composition), a free four-week workshop led by artist and activist Keith Hennessy, and featuring special guests Stephanie Hewett, Randy Reyes, and Kanyon CoyoteWoman Sayers-Roods (Mutsun-Ohlone, California Native), who inaugurated the opening session. Here, we’ve collected responses to each session, as well as supplemental materials created by Hennessy and his guests. One of the strangest qualities of Keith Hennessy’s work is the way his dances often seem as if they are not happening at all. That the striking images of Sink, future friend/ships, Turbulence — a flying shaman falling through an upside-down Christmas tree, Arab astronauts gently imploring us to remember them, an Irish jig in the middle of a riot — just kind of appear before us. Though I find most politically engaged art clunky, Hennessy’s has an effortless charm that makes one want to engage even when what’s before one is horrific and terrifying. 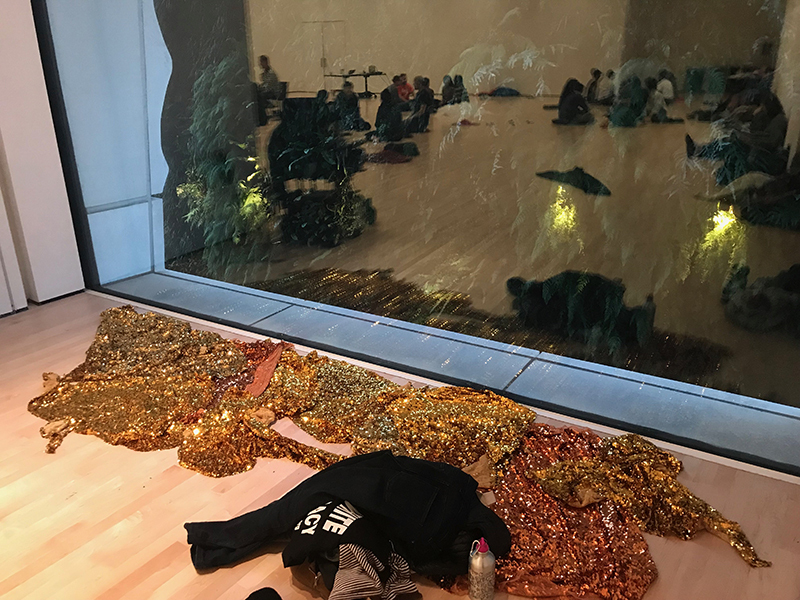 So I wondered what he might teach a group of fifty or so people, dancers and non-dancers alike, about creating performances on — among other problems — occupied land, Ohlone land. Or put another way, given our knowledge and understanding of the long history of violence that has brought us to the present moment, to the fourth floor of SFMOMA for the second of Hennessy’s de(composition) workshops, can any art or artistic practice find its way to an authentic and demanding ethics? That was one of the primary questions of the evening and it did get answered — though rather slyly and after much fun. There’s something of the dinner party bon vivant to Hennessy; there he is, before the workshop officially begins, handing out a lemon ginger tea (spiked if you wanted) of his own concoction. The participants are circling around him even as he’s saying it’s okay not to circle around him, encouraging us to wander about and go where we like. This seems a frivolous observation, but the idea of choice — of not following the unconscious dictates of the group — was crucial to the workshop. The freedom to set our own levels of engagement allowed for a casualness of spirit. The official workshop began with a land acknowledgement, a pleasant but charged conversation that touched on the importance of trying to say a native word or two, even if our pronunciation was less than ideal. And then we discussed the plants and animals around us, the fact that the Bay isn’t a bay but an estuary, and finally, the violence through which we supplanted a rich, complex culture with our own. 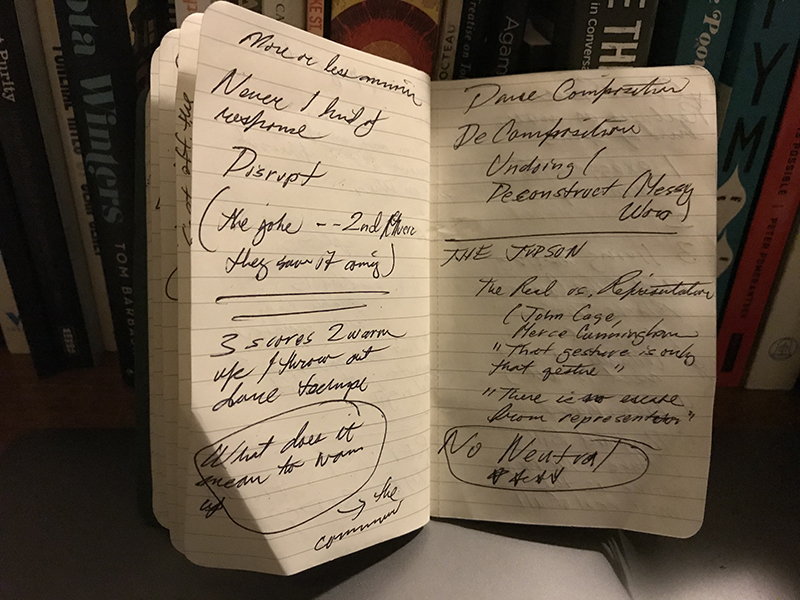 We had created and were suddenly part of what Hennessy called a “contested cultural space.” I had seen versions of this before in his work, but it was starker in workshop form, a slippery mix of owning up and moving forward. It felt appropriate that this was the moment when the workshop burst into an improvised, provisional performance. Cued to a score that included Steve Reich, Le Tigre, and Jonsi & Alex, there were three simple directives: first, shake; second, shift your weight as slowly as you can; and third, touch an object, the floor, yourself — make a connection. This isn’t a review, but I would buy a ticket to see what happened all over again. There, in embryonic form, was a Hennessy performance coming to life, and all he did was set the context, give some direction, and trust that people would find their way. It’s as if by foregrounding the political and social, what comes next — the performance — allows us to find new possibilities, to slip away from the violence that has shaped, plagued, and still surrounds us. A lot happened in between the beginning and the end of this three-hour workshop, but the last exercise did tantalizingly mirror the first, which felt purposeful. We split into groups of three and played the game “fake healing,” created by Valentina Desideri, wherein one of us was the patient and the other two healers. Just as at the beginning of the evening, there were three rules: one, there was nothing wrong with the patient; two, we had no power to heal the patient; and three, we should try our best to help the patient. It was a tricky, difficult-to-carry-through experience, but for everyone there who came to think about what it means to create politically engaged art, the end result felt like an implicit and provocative proposition. After we finished, Hennessy pointed out that so much political art starts out with the assumption that there’s something wrong with the audience. And so he asked us: What if there’s nothing wrong with the audience, and we have no powers to help them, but we would really like to do what we can? The questions felt measured and reasonable, but the path they offer — by way of an aesthetic philosophy that is both ethical and alive to the world — is striking. Here’s a vision that is as bracing in a workshop as it is when it’s performed on stage. And at the very least, that feels like the first rumblings of a revolution.